Legend has it that Johann Ludwig Stifel walked all the way to Wheeling, where, by 1835, he had established a small dyeing shop in a log cabin with just a $10 investment and a piece of cotton cloth. Born in 1807 in Germany, Johann Ludwig Stifel immigrated to Baltimore, Maryland when he was 26. He later moved to Bethlehem, Pennsylvania, where he learned the textile trade working in a wool mill. Armed with the knowledge of the trade, the young entrepreneur made his way to Wheeling in the 1830s, and within a short time of opening his dye shop, business grew enough for Johann to open a larger calico shop on the southeast corner of 9th and Main Streets. The lower levels were for dyeing and printing while the upper level housed Johann, his wife Barbara Becht, and their children. In 1859, Johann’s sons Louis C. and William F. joined the company and, when their father retired fifteen years later, J.L. 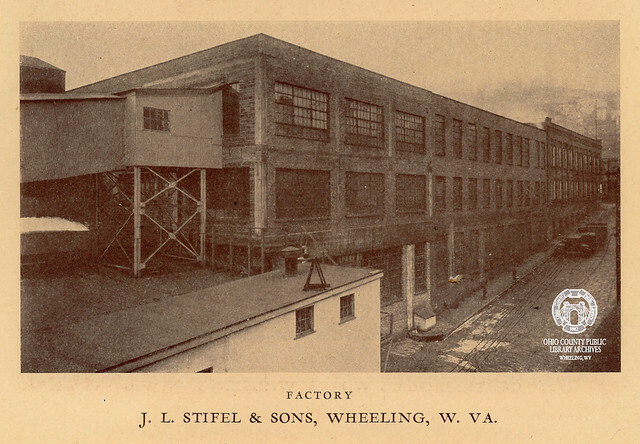 Stifel and Sons had grown into one of the nation’s largest calico printing establishments. The third generation of Stifels moved the calico works to a new location on Main Street between 3rd and 4th Streets. The company had grown from a one-man operation in a log cabin to a 70,000 square foot plant, with many employees, which was shipping products like indigo dyed prints internationally. A meticulous process, the manufacturing including singeing the cloth to remove fuzz and lint, boiling the cloth to remove waxes and oils, bleaching the cloth to remove natural colors, and dyeing the cloth with indigo extracts to give it the distinctive Stifel blue color. During the First and Second World Wars, the company switched over to war time production, providing textiles for France as well as khaki for American soldiers. By 1943, almost 90% of the company’s production was war-related. After World War II, increasing costs and foreign competition caused instability in the national textile industry. Stifel merged with Indian Head Mills in New York in 1957, but even after the contracts were signed the company had to phase out operations. On December 17, 1957 after 122 years of service, Stifel & Sons Calico Works closed. The plant sat empty until March 8, 1961 when it caught fire and the entire building was destroyed. All that was left standing was a 275 foot smokestack, which was finally toppled on March 25, 1969. Among the diversified industries of Wheeling a long-established and important one is the calico printing establishment of J.L. Stifel & Sons, at the corner of Main and Ninth streets. This firm makes indigo prints exclusively, buying the cotton direct from the mills and importing their own dye stuffs from Calcutta. In 1835 J.L. Stifel established this business. In 1844 he removed to the present location, which has since been greatly enlarged. In 1866 his two sons, L.C. and William F. Stifel, were taken into the firm, which became J.L. Stifel & Sons, and the style of the firm continues so, although the founder of the house retired in 1877 and died a few years later. The building is 132 by 166 feet. The Messrs. Stifel expect to increase their facilities shortly to twice the present capacity. For a long time their products had only a local market, but are now sold all over the West and Northwest. Their prints have a well earned reputation for high and even quality and everywhere "Stifel's Wheeling prints" are known by name and appreciated. The success of the house is an illustration of the saying that "merit wins." ▶ Listed in the Callin's 1896 Wheeling City Directory at 900 Main St.